London agency Studio Output has created three cool promos to big up movie rentals and downloads on the Sony PlayStation Store. What makes the clips more fascinating is that they wouldn’t have turned out the way they did without a key piece of PlayStation technology – the Move motion controller. The clips are set in a living room that magically transforms into the world of of a well-known Hollywood franchise (think piratical capers in western Atlantic waters, for example) the moment the sole character activates his PlayStation. 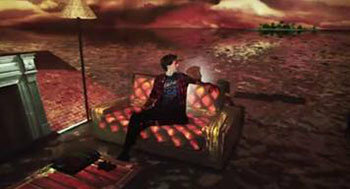 Each clip was shot in one take, the visual effects created using a mixture of props, live actors camouflaged in Lycra and, crucially, the technique of projective mapping – projecting backgrounds plus animation onto the environment, in this case the walls, furniture and other surfaces in the room. To look realistic, the images being projected have to be distorted to suit the geometry of the “screen”, and the viewpoint must be stationary. But Studio Output wanted to capture the results using a roving camera. That was where the PlayStation Move played a key role. Studio Output attached it to their camera and used it to track its movements. The readings were then fed back to a system which adapted the projected image in real time, making the backgrounds dazzlingly convincing throughout each clip. There’ll be a chance to catch up with Ian and others from his team when he hosts the latest Glug networking event at Fabric in London on December 14. Billed as Now! That’s What I Call Christmas 2011, the evening will feature Anthony Burrill and Mr Bingo among the speakers. Tickets cost £10.